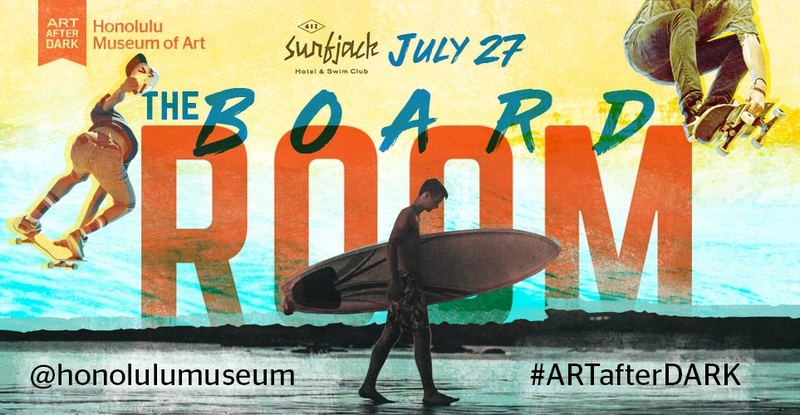 Get your boards ready for this event, inspired by the Surf and Skate Film Festivals! • DJ Ramyt and DJ Jimmy Lee bring a beachy, house sound to Luce Courtyard. • Jam out with Men in Grey Suits' surf rock! Catch them in Central Courtyard at 7pm. • Jeff Gress (designer of our 2018 Surf Film Fest t-shirt) will be custom etching glass jars in the Museum Shop from 6-8pm. The lid of each jar is made from a recycled skateboard. Specialty cocktail: The Surf Mai Tai, a modern take on the tiki classic with Bacardi 8 rum, orange curacao, French almond syrup, and fresh lime juice.